This double CD is a kind of 'Asher's juke-box'! The production makes these largely acoustic renditions sound like they are being sung in a cathedral, indeed many of Asher's concerts ARE sung in churches. Imagine a candle-lit cathedral and the extraordinarily warm intimacy of Asher's voice as he sings just with a guitar, or a keyboard generating a choir sound. Notable are his versions of 'Stand by me', 'Unchained melody', Tim Hardin's 'Hang on to a dream', Leonard Cohen's 'Alexandra leaving', and Bob Dylan's 'Tomorrow is a long time'. Ballads by Bruce Springsteen and Van Morrison are also represented, and... perhaps more surprisingly... by The Stranglers and The Smiths too! There is great beauty, purity and emotion in this recording, and it's almost as if a spell is cast whereby well-known songs are re-interpreted to reveal the mystical intensity sometimes inherent in them. Asher Quinn is best known as a new-age/ambient composer, selling over half a million albums since his debut in 1987. At heart, however, he is something of a balladeer. 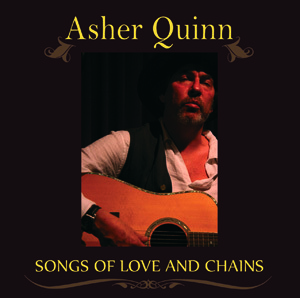 His 2007 album, Songs Of Love And Chains, covers several decades of musical history with a collection of cover songs done in the simple and clear style of a bard. Artists such as Leonard Cohen, The Righteous Brothers, Jimmy Webb and Bob Dylan get Asher-ized on this two-disc set. Quinn opens with an ethereal cover of Bruce Springsteen's 'I'm On Fire'. Sung over a thin veil of undulating synth, Quinn's voice hovers, quixotically. It's a solid enough rendition though. 'Golden Brown' is pretty and watery in its feel, fading away in much the same rippling fashion as it plays. Quinn paints The Righteous Brothers' 'Unchained Melody' with a similar brush in a minimalist synth arrangement. His distinctive vibrato plays about the melody in memorable fashion, although he struggles with the lower notes at times. He then takes more of a folk-inspired approach on 'Dona Dona Dona', sticking to guitar and harmonica in an energetic and inspired arrangement. Ben E. King's 'Stand By Me' gets softball treatment, setting it up as tortured piano ballad. Quinn takes emotive turns in Tim Hardin's 'Hang On To A Dream' and Springsteen's 'Lift Me Up,' but casts a real spell in the tragic 'Down In The Willow Garden.' Love goes violently wrong in this classic-style folk song, and Quinn gives it voice in a blend of denial and delusion mixed with love. Quinn hits all the right notes on 'Do What You Gotta Do', making the most of Jimmy Webb's creation in a touching performance that's full of emotion and nuance. 'Pastures Of Plenty' doesn't go quite as well, with Quinn setting the key too low for his own vocal comfort. Leonard Cohen's 'Suzanne' gets much better treatment, an almost wavelike feel that speaks of cycles within cycles. Quinn is perfectly matched to this song, and it's one of the absolute highlights on the album. Quinn's take on 'The Highwayman' is decent enough and he hits all the right notes in a technically perfect performance. 'Only You' is better still, with Quinn capturing the heart and soul of the Erasure Song while using a surprisingly fitting harpsichord sound. He makes easy work of 'Mr. Bojangles' in a strong performance that's filled with the quiet awe the song achieves in its best moments, and revisits Leonard Cohen’s 'Hallelujah', sticking very close to the feel of the original in a quietly moving performance. He fumbles a bit before stumbling into his wonderfully stripped down and lovely take on Willie Nelson's 'You Were Always On My Mind'. Simplicity is the key here, allowing Nelson's classic melody and lyrics to speak for themselves. Quinn likewise scores with a take on Sam Cooke's 'Bring It On Home To Me', an understated but likeable interpretation to one of Cooke's finest songs. 'All Along The Watchtower' doesn't fare quite so well though, when one thinks of Jimi Hendrix's performance. 'Not Dark Yet' has its own magic, a quiet penultimate track that finds Quinn raising his game at just the right time. Songs Of Love And Chains closes with Winston Rodney's 'Jah No Dead'… and the album that has many more positives than negatives. There's enough here to make the album worth owning, but you couldn't be blamed for selecting your favourite fifteen tracks or so and sequencing your own Quinn album out of the lot. This is just my kind of music. It's very relaxing and it can sometimes boost my spirit. I listen every day. My favourites are 'Sad eyed lady of the lowlands', 'Hey, that's no way to say goodbye' and 'Paradise'. All the songs are like jewels in the sky. My husband likes 'Where have all the flowers gone?' and 'Suzanne' too. Your CD feels like the sun is shining for me. Liked many of your covers, especially the Smiths and the Stranglers! I've been listening to Songs of Love and Chains recently, and my personal fave is 'Hang on to a dream'. 'Unchained melody' has been my signature tune for years. I just love your YouTube version of it. That's a great version of 'Golden brown'!